Jack Kevorkian was born on 26 May 1928 in Pontiac, Michigan and in 1952 graduated from the University of Michigan Medical School. Kevorkian became a supporter of euthanasia and wrote articles for the German journal Medicine and Law extolling its virtues as he saw them. In 1987 he began to place advertisements in newspapers in Detroit offering “death counselling”. 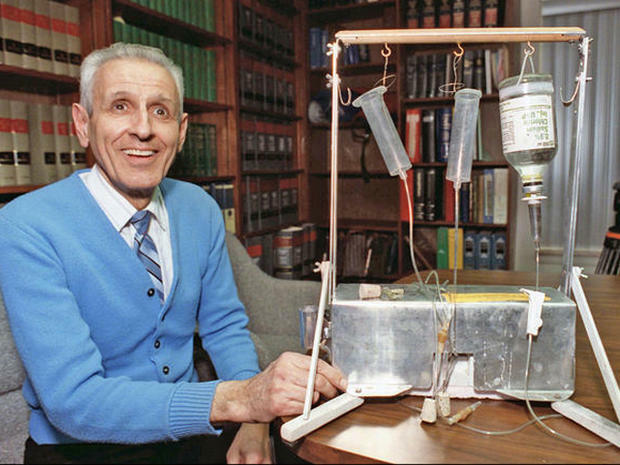 Beginning in 1990 and ending eight years later, Kevorkian helped more than 100 terminally ill people to die. They hooked themselves to a machine of Kevorkian’s making, which he called a Thanatron, and it gave them a fatal dose of drugs. In 1991 the State of Michigan revoked Kevorkian’s medical licence. Without a licence he was unable to get the necessary drugs for his Thanatron. After this he helped people to die using his Mercitron, basically a gas mask connected to a canister of carbon monoxide. He was tried several times for assisting in suicides but each time was acquitted. “Dying is not a crime,” he said. On 17 September 1998 he made a videotape of the death of Thomas Youk, 52, who was suffering from motor neurone disease. On tape, Kevorkian injected Mr Youk with potassium chloride. Previously, Kevorkian had claimed that the patients had instigated their own deaths. He then dared the authorities to stop him. The tape was broadcast on the current affairs programme 60 Minutes on 23 November 1998. The District Attorney called Kevorkian’s bluff and on 26 March 1999 he was charged with first-degree murder and the delivery of a controlled substance to which he was not entitled (as his medical licence had been revoked). Kevorkian represented himself at his trial and proved the truth of the maxim that a man who represents himself in court has a fool for a lawyer. He was convicted of second degree murder and was sentenced to 10-25 years in prison. Judge Jessica Cooper told him, “You were not licensed to practise medicine when you committed this offence and you hadn’t been licensed for eight years. And you had the audacity to go on national television, show the world what you did and dare the legal system to stop you. Well, sir, consider yourself stopped.” Kevorkian was paroled on 1 June 2007.